When women shunned shopping app Tote, CEO Ben Silbermann put a pin in it, and created social media’s fastest growing website. Before Pinterest became social media’s fastest growing website, and landed on the cover of Fast Company, CEO Ben Silbermann set out to transform every cell phone into a clothing retail outlet with an app called Tote. Designed to change shopping on your phone from being a “pain” to “easy and fun,” according to its Facebook site, Tote connected consumers with dozens of retailers, including Banana Republic, Anthropologie, and American Apparel. The app, launched in 2009 by Silbermann, Paul Sciarra, and Vikram Bhaskaran, let customers save their favorite items, alerted them when clothes went on sale, and pointed them to nearby stores. And it did so while looking cool: Tote won the audience choice award and $25,000 in NYU Stern’s Berkley Center for Entrepreneurship & Innovation 10th Annual Business Plan Competition. Ben Silbermann, Pinterest cofounder and CEO, rendered in 22,765 pins by Eric Daigh. Brian Cohen, the company’s first investor, was scouting the tables at the NYU business competition in 2009 when Silbermann approached him. Like most angel investors, Cohen said he was busy and to keep the pitch short, and then listened to Silbermann for 15 seconds before telling him, “I don’t really care what you’re doing, I’ll invest with you.” The pitch was so “crisp” and Silbermann had so “succinctly” described customers’ needs that Cohen didn’t just offer to invest. In short order he also cancelled all the paper catalogs that he received at home, inspired by Tote to move toward more environmentally friendly virtual ones. While the app was a suitable replacement for bulky catalogs, what Tote didn’t do was make mobile payments easy. At the time, the payment technology just wasn’t advanced enough to allow for simple, on-the-go transactions, said Cohen in a telephone interview. “There wasn’t the level of sophistication that there is today.” (Cohen, chairman of New York Angels, made clear he was not speaking on behalf of the company, only giving his perspective as an investor–and he declined to disclose how much he’s invested.) The lack of a workable transaction system was more than a little inconvenient for an app that marketed itself as making shopping more convenient. It threatened its very existence. When Cohen heard the new plan, he doubled down on his investment. But while Tote users weren’t making purchases via the app, they were amassing growing collections of “favorite” items to share with their friends. To Silbermann, who had collected insects as a kid, this was yet another example of people’s tendency to share their collections with one another. And while there was already a plethora of sites that allowed people to display virtual collections, they were all limited to a single item. Silbermann in the 2010 L2 Innovation Forum as a “fragmented” way for people to show one another the things that interested them. So a year after launching Tote, Silbermann pivoted to offer people a visually appealing way to display all their collections–whether they were books, adorable dog images, or women’s clothes–on the same site. When Cohen heard the new plan, he doubled down on his investment. Cohen claims he wasn’t concerned that Tote was a dud and Silbermann decided to move in another direction. He was backing Silbermann, not any particular business model. Can Ben Silbermann Turn Pinterest Into The World’s Greatest Shopfront? Six months after its launch, Pinterest, then still an invitation-only site, had 80,000 collections, on everything from favorite beverages to clothes sold at Anthropologie. By August 2012, the site had 25 million unique monthly users, almost 20 times the number it had the same month a year earlier, and had become the fastest standalone social networking site to reach 20 million visitors, according to comScore data. In May, Japan’s Rakuten invested $100 million in Pinterest, in a deal that valued the company at $1.5 billion, the biggest investment for an early stage business in the second quarter, according to the PricewaterhouseCoopers/National Venture Capital Association MoneyTree Report. 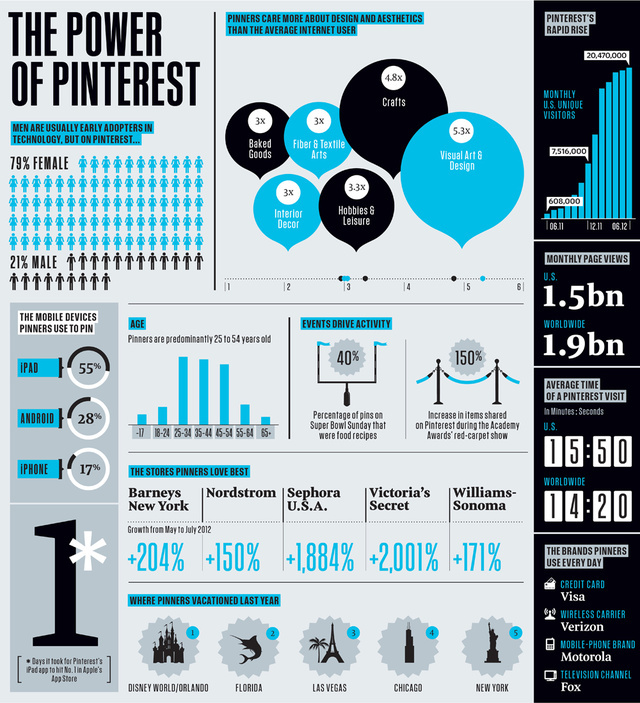 In the process, Pinterest has spawned legions of imitators. And it owes its success to the power of the pivot. Click here to view the infographic in more detail.